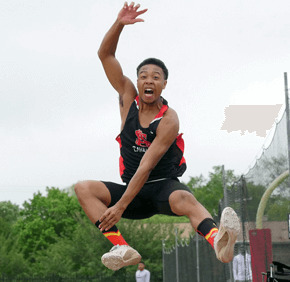 The Maryvale Prep girls had a strong showing, and John Carroll hurdler Holly Driver and Calvert Hall jumper Lawrence Cager were double-winners as schools from the Archdiocese of Baltimore concluded the outdoor track and field season with championship meets at Calvert Hall May 9. Maryvale posted 164.5 points in the Interscholastic Athletic Association of Maryland meet, which McDonogh won with 170.5. The Lions got first-place finishes from Cameron Hinton in the 400 meter dash, 56.48 seconds; Paige Adams in the high jump, 4-feet-10-inches; Alicya Guckert in the pole vault, 9-0, and from their 1,600 relay team, 4:02.65. Driver took the 110 and 300 hurdles in 15.57 and 45.84 seconds, respectively. Kayla Hamilton of Mount de Sales won the triple jump with an effort of 34-3, and Seton Keough took the 400 relay in 49.68. De Sales and Seton Keough finished third and fifth, respectively, in the team standings. In the Maryland Interscholastic Athletic Association meet, Loyola Blakefield and Mount St. Joseph finished second and third, respectively, with 116.5 and 97 points. Calvert Hall took fifth in the team competition, won by Gilman. Cager won the high jump with a clearance of 6-2 and the triple jump, 45-3½. Loyola Blakefield got first-place finishes from Kenny Rowe in the 400, 49.15; Michael Wegner in the 3,200, 9:20.73; and from its 400 relay, 42.79. To view a slideshow, navigate the arrows below. The other winners from Catholic schools were: Dylan Beard, Archbishop Spalding, 110 hurdles, 15.40; Montrae Coston, Mount St. Joseph, 300 hurdles, 40.00; Matt Selba, Archbishop Curley, 145-8; and Mount St. Joseph, 800 relay, 1:28.72.